1 - Today Aarav had a special guest for his therapy session. Minnie Vaid, film maker, Author, a multifaceted personality came to see Aarav's therapy session to see his progress. Remember I told you about the documentary movie being planned?? My little rockstar will now really be a Movie Star!!! Yay!!! 2 - The waiting room of KEM has a slide, a trampoline, and a see-saw to keep kids entertained when waiting for their turn. 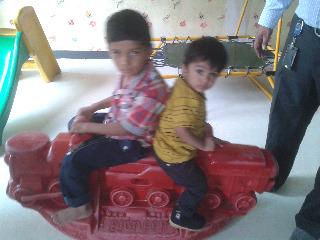 As we go to KEM so many times, and Aarav gets to play every single time, Aarav now thinks the play area is his 'turf' and now 'shares' his playthings with other less-frequent kids who come. Corollary to the above is, that, he makes other kids share it with him even if they were playing from before we came, or even if they are elder or bigger to him. He is not afraid at all. 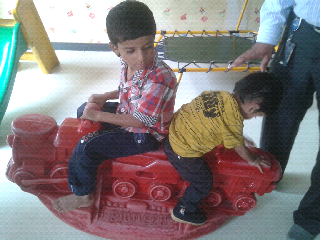 The big boy had to move to give Aarav his space.